Weather apps for the iPhone and iPad can be roughly divided into three categories: 1) those that provide detailed weather information and forecasts that can also be found on the Web, for free, such as the offerings by Accuweather and The Weather Channel; 2) those that provide detailed and specific meteorological information for people interested in aviation, skiing (snow reports), hurricanes, and sea conditions; and 3) those that provide basic weather info and (relatively) short-range forecasts, often served up with eye candy. Weather+ falls squarely into the third category—the $1 offering from International Travel Weather Calculator is a beautiful, well-designed app. 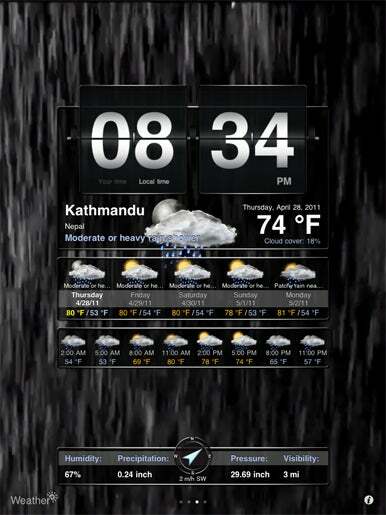 Let It Rain: It may not be the best time to be outside in Kathmandu, but the view from Weather+—rain in the night—makes it seem pretty romantic nonetheless. One download from the App Store includes slightly different versions for the iPhone and iPad. On both devices, you get basic time, temperature, humidity, and precipitation forecasts, for as many locations as you’d like. Each screen provides data for one location, and you can choose to display all of the information available through the app—the current time and conditions, a five-day forecast and three-hour details for the current day—or as little as just the time and current conditions. Adding locations is a simple process, as is switching between what amount of information you’d like displayed. After you’ve completed these settings, you can scroll between locations with a simple finger-swipe. What makes Weather+ a worthwhile buy is that with each location display, a time-and-weather appropriate photograph fills the screen, providing a background that distracts (because the images are gorgeous) but does not make the weather information less readable. Smaller Window: On the iPhone or iPod touch, Weather+ provides slightly less detail about the day’s weather than what you get on the iPad. On the iPad and iPhone, the forecast extends out to five days, and detailed information for every three hours of the current day is also displayed. Weather+ can be viewed in both portrait and landscape mode on the iPad; on the iPhone, the app can only be viewed only in portrait mode and you only get three-hour information regarding the next 12 hours of weather, rather than 24.